Fusing process is one sort of alternative method of fabric joining and is vastly used for attaching interlining. The fusible interlining consists of a base cloth, which may be similar to that used for a sew-in interlining, and which carries on its surface a thermoplastic adhesive resin, usually in the form of small dots, which will melt when heated to a specific temperature (Carr and Latham). There are various types of fusing machines like specialized fusing presses, flatbed fusing press, high-frequency fusing, continuous fusing systems. 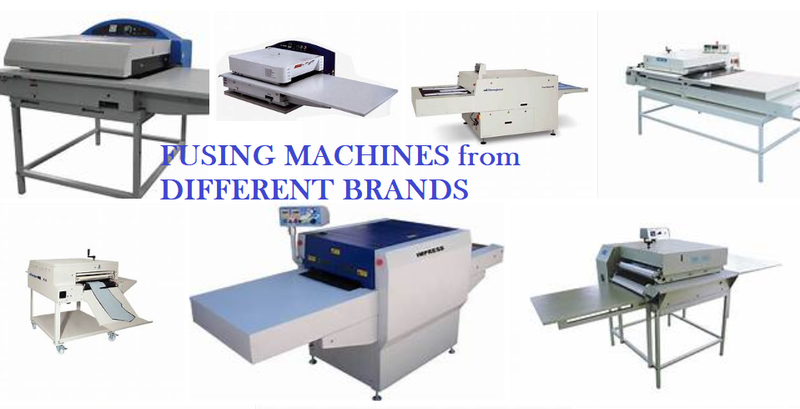 In this post, I have shared a list of fusing machine brands and solution providers. This list would be helpful to them who are planning to install best in class fusing machine in their factories. Some of these fusing machines I have seen in garment factories, some in garment machinery exhibitions and other found through online research. I have provided the website link to each solution providers. You can explore more about the fusing machines on their websites. They are the Leading Exporter of continuous fusing machine, top fusing machines, fabric fusing machine and collar fusing machine with features like heating of lower plate to improve the banding between the fusing material and the fabric, pneumatic movement of the frames, additional flapper screen, integrated with advanced cleaning system etc. Veit has become one of the most prominent consultants along with first in class machinery with influential market internationally. “FX DIAMOND 100/1400/1400l/1600” has taken fusing to next level with functions like exact temperature control directly at the belt, consistent pressure over entire operating width, optimal adjustment of pressure system and heating sequence etc. Along with that “FuseMaster BX600/1000” series fusing machine is sturdy with a compact design and extended heat chamber. It requires minimal floor. Shirt Fusing Machine BH600can be operated by only one person, has an active cooling system for fused assemblies. Ngai Shing Development Ltd is a Hong Kong based company providing industrial machineries including Fusing machines like manual fusing press’NS-2550’, NS-2160, NS-5600-450, NS-5610, NS-5611-1000 are their best in class fusing machines with automatic balancing system, high-temperature resistant Teflon belt as conveyer belt for faster heat transfer, variable speed control, adjustable conveying speed along with adjustable pressing pressure with air cooling device for better fusing effect. Sakho and Martin group provides one of the best fusing machines. SA-450GS is a mini openside continue fusing machine with features like super liner guide belt to prevent the belt from warping, powerful ventilate fan to lower the temperature of electronic components and use of excellent heat poor Teflon belt. Oshima international apparel machinery provides for continuous fusing machine, fusing press machine, fusing machine for transfer. OP-450GS, OP-60LNII, OP-450GST are the best continuous fusing machine with features like powerful pressure up to 6kg/cm^2, electronic temperature control and rotary straps preventing interlining clinging to the belt. IPT M120/230V, IPT M120/230V/TM are the fusing plate presses with electronic controlled fusing time and temperature regulation. WGM is the pioneer in India to bring fusing machine technology in the early 1990s. They have machines from flatbed fusing machines to conveyor belt fusing machine to ultra-fast automatic fusing machine. AG-450 is a flowmatic fusing machine curing a machine with PID temperature control for most accurate stable temperature, emergency automatic switch etc. AG-550 even have an inspection table at the feeding end and cooling system at the receiving end. Duke is another such international brand offering best in class industrial fusing machinery. They have continuous conveyor type fusing machine DL-500, DL-600 can heat and wet the material and the lining at the same time ensuring best fusing results. Along with pneumatic fusing press machine 900LCS/600LCS have new rotating stripping mechanism, provides choosing a fusing style of a single side or double sided for better quality. Brands categories fusing machines as continuous fusing machine, top fusing machines, fabric fusing machine, collar fusing machine etc. In this post, few images of fusing machines are shared which are taken from the fusing machine supplier’s company website. Popular fusing machines for garment component fusing, fusing machine brands and manufacturers. Fusing machine models.